Story of “Los Calicantos” aqueduct begins a long time ago, about two thousand years ago. The main attractive of the aqueduct is that all its sections are unfinished. It never transported water therefore; it brings the singular opportunity to see the work as it was left by the Romans centuries ago. 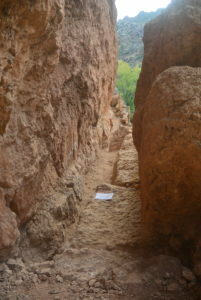 Aqueduct has an easy access from the path of “Peña María”, which runs by the Turia River, to one of the entrances of the tunnel, where there´s a small lookout with some information about “los Calicantos”. “Los Calicantos” Aqueduct runs at 215 meters above sea level, at the base of the highs by the Turia river canyon on its left bank, about 25 meters height from “Peña María” path. It runs through important natural and historical resources. 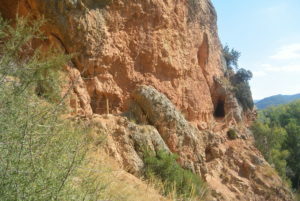 Wild goats and eagles are part of this mountains landscape full of caves and crossed by ravines. In September 2017, archaeological excavation works and improvement of accessibility started, with the purpose to rediscover this unique space in Gestalgar. Nowadays, there’s a 70 meters zone that can be visited. At the aqueduct walls, it’s possible to see the rock marks and alcoves where workers put lamps to work. As an unfinished work, it’s not covered by hydraulic concrete to reduce erosion. Water never flew through the aqueduct, but there was life during long periods. 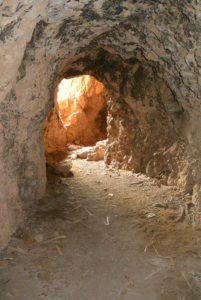 Between the 12th and 13th centuries (during Al-Andalus era) one of the tunnel sections was used as a home by people of Gestalgar. By the window of the old aqueduct, was installed a kitchen space including a “tannur” (a small circular oven), built by an unusual technique based on superimposed clay “churros”. 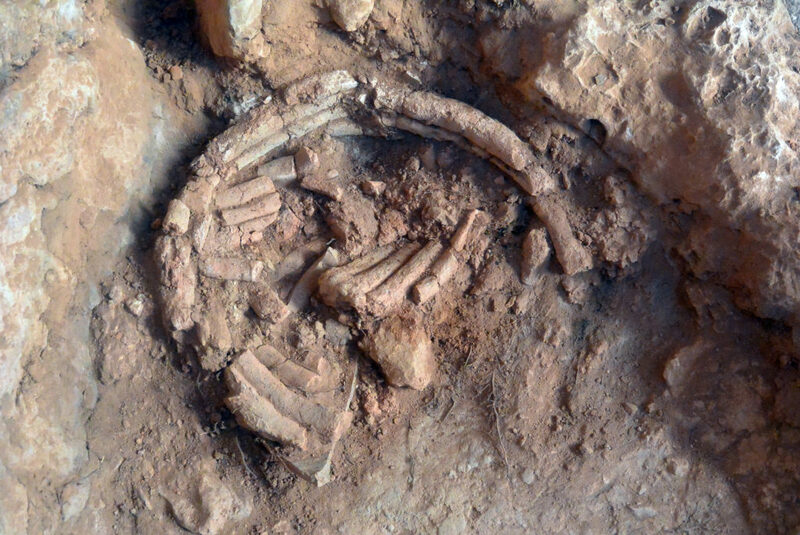 Oven was used to make bread and other foods cooked using pots and pans, which fragments have also been found during archaeological excavations. A bank of stones separates this space from the bedroom area, formed by a bed made of twigs, straw and palm. Here, it was also found part of a mat or basket and an espadrille’s sole. For now, there is not information about its starting point or its end; it could start by a fountain between Chulilla and Gestalgar, the end would be located at Llíria (Old Edeta). The biggest question is to know why the engineering works are unfinished until our days.